Railways are said to "annihilate both time and space"; this they can only do safely and satisfactorily by keeping time. Well into the 1800s, the time of day often differed in neighboring villages and towns. Partly, it was because time was a matter of guesswork. Sundials were in common use. 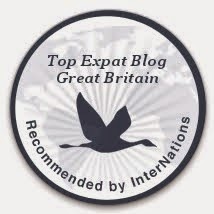 At best, ordinary people might rely on a church bell or a town clock for guidance. Appointments and meeting times were vague and flexible. Schedules were advisory, not prescriptive. Most people had no watch or clock in their home until the 20th century. In the 19th century, clocks were rare; accurate clocks rarer still. Moreover, there was no standard time across a region, country, or continent. Heading east to west across Britain, a traveler gained fifteen minutes or more over the course of 24 hours, and likewise lost fifteenish minutes if traveling east. Norwich time was several minutes ahead of London time. Oxford was officially 5 minutes and 2 seconds behind London's time; Leeds was 6 minutes and 20 seconds behind; Exeter was 14 minutes behind. This led to mayhem and disaster for the emerging rail industry. 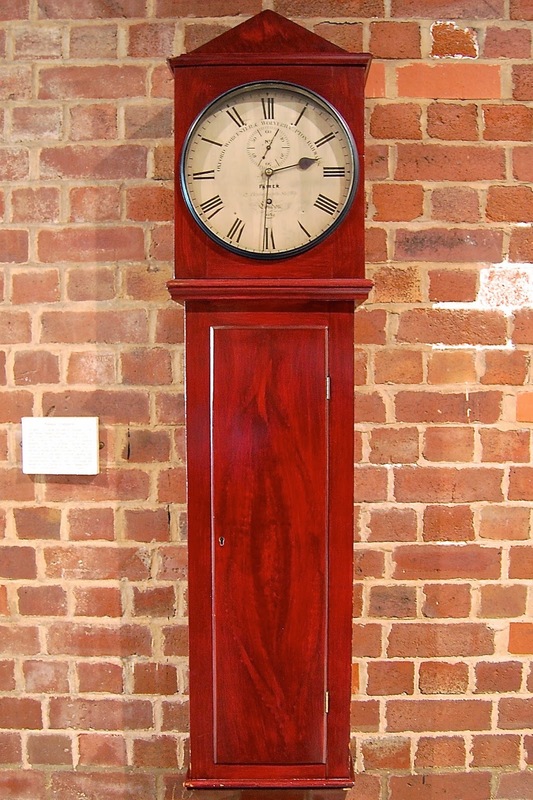 In the 1840s, clocks — and time — became standard across British train stations. 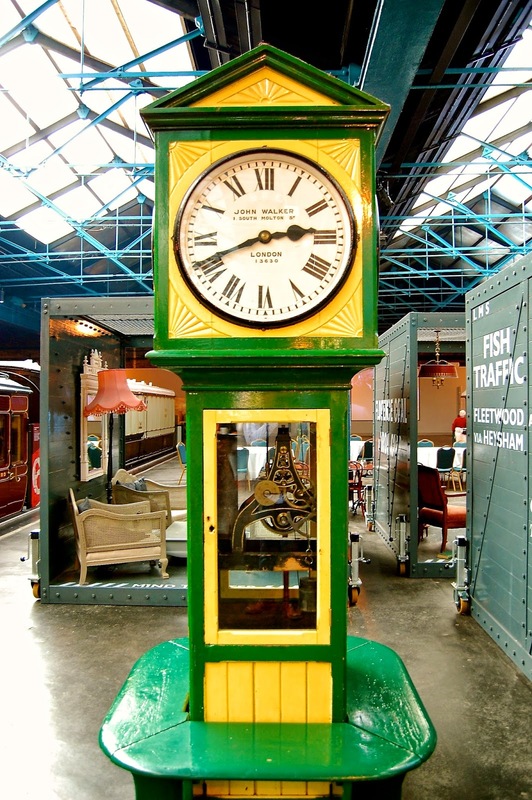 This clock, from the Great Western Railway, was built around 1850 and used for more than 100 years. Rail transport was developing at a lightning speed. Steam locomotives first appeared in 1811. The first steam trains for passengers came in 1825. By 1830, the first inter-city route opened. Mail was first sent by rail in 1838. In 1839, the first timetable was published. By the 1850s, Britain had more than 7,000 miles of track. As more and more trains crisscrossed the country — carrying goods and, increasingly, passengers — the need for standardization became readily apparent. Neither stationmasters, nor train conductors, nor passengers were certain when a train would depart its station. Trains frequently delayed departure to allow for stragglers. Travelers often missed connections because of the vagaries of timekeeping in different towns. Even worse, the running of trains across the network of tracks had become a nightmare of accidents and near-misses. The railway system was an integrated whole, even if it was operated by numerous privately-owned railway companies. Timetables had just been invented, but given the non-uniformity of time across the land they were more ideal targets than actual planning tools. Even if the train personnel could figure out the complexities of local times, no one could rely on trains traveling at regular and reliable intervals. Trains which should have clear track in front of them might find themselves delayed by trains which had dithered before leaving a station or, perilously, find trains heading toward them from the opposite direction. It was a mess. A dangerous mess. And even more significantly for these new titans of industry, a costly mess. The railway bosses demanded that time be standardized. At first, they met with resistance from many municipalities, which had no desire to reset their clocks at the fiat of nouveau riche railway owners. So the rail bosses took matters into their own hands. By 1841, the Great Western Railway ordered that all of its stations would use London time, regardless of the local time around the stations. Passengers who wished to ride the trains found themselves forced to use the railway's timekeeping instead of the local timekeeping. Other railways followed suit. In 1845, the Liverpool and Manchester Railway petitioned Parliament to require a single uniform time for the entire rail network. The petition failed. But the railway bosses pushed on. In 1847, the major railway operators agreed they should all adopt London time — generally called Greenwich time due to the location of the Royal Observatory — as soon as the Post Office supported the shift. Carrying of the mail was a major source of income, of course, and the Post Office was a valuable client. But more significantly, although the Post Office had no official role in setting the standardization of time for the railways, it gave the railway operators a veneer of government authority. When the Post Office granted its consent later in 1847, most British railways adopted London time on 1 December 1847. Still, some municipalities held out. Instead of changing the time on their clocks, they decided . . . to add another minute hand. Essentially, they stuck their tongues out and said ppfffttt! One minute hand showed the local time while the other, sometimes smaller, minute hand showed the new railway standard time. Watches on sale showed local and London time. Eventually, the silliness of their behavior outweighed their protest, and the local time went away. Bristol held out until 1852. By 1855, approximately 98% of the public clocks in the U.K. were on London time, though some cities, like Bath, dragged on until 1860. Finally, in 1880, Parliament passed its Definition of Time Act to confirm the fait accompli on the ground, a standard time across the United Kingdom.